« July 4, 2012: Centenary. July 31, 1975: L’ete au Connecticut. It’s a scene Monet could have painted. A sun-parched, stubbornly green parcel of grass juts into a cerulean expanse of water, with a dark rim of looming land barely visible in the far distance. A speeding boat slices from right to left, while a rock outcropping breaks the water near the picture’s center — close enough to be reached by the handful of bathers poised in various attitudes by the shore. Rounding out the scene at far right is a single shade tree, its dark-green leaves offering solace to at least one party of travelers camped out under its branches. This image isn’t hanging in a museum anywhere. Nor, as far as I know, was it ever rendered in oil on canvas. 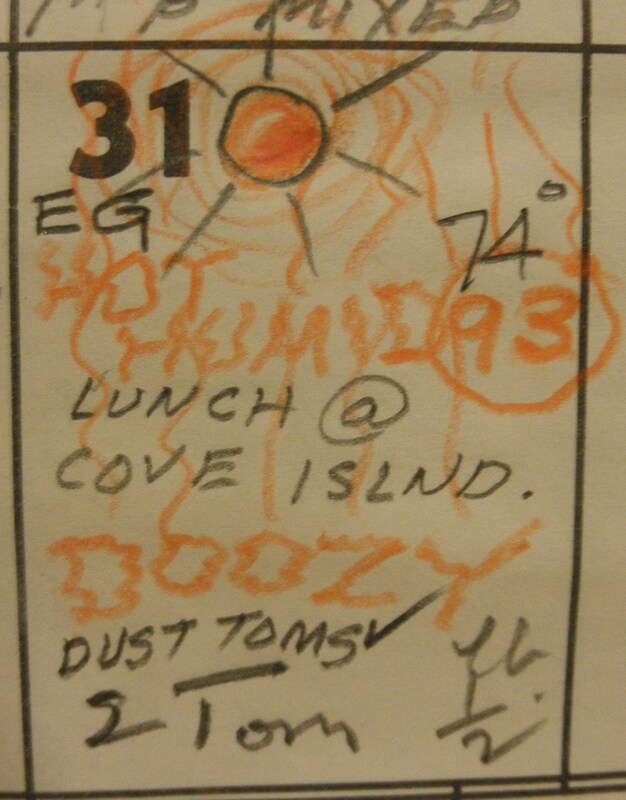 My grandfather, with his artist’s eye, captured it with a camera one summer’s day. And I’m going to guess wildly that I know just where and when he took it. 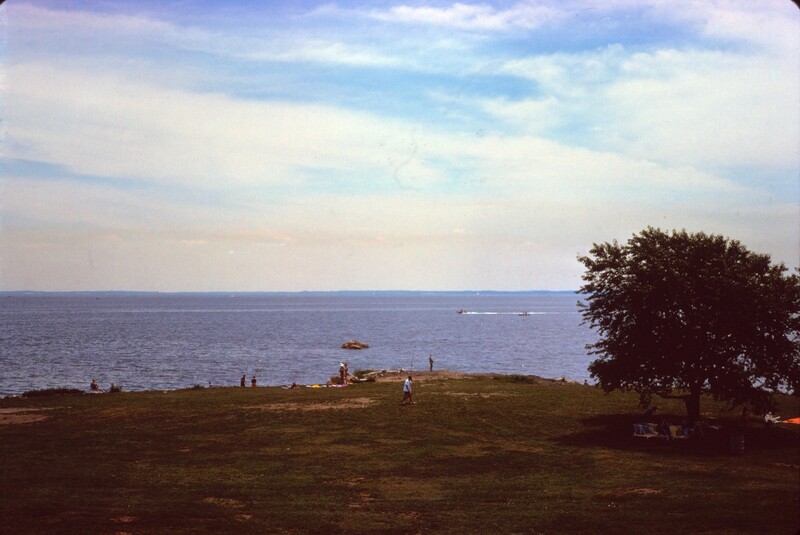 Cove Island Park is owned and operated by the city of Stamford, and overlooks Long Island Sound. I’ve never been there myself, so I can’t be sure. But I’m somehow convinced my grandpa’s faux-Monet picture — which I know dates to 1975 — was taken there. You can fish at Cove Island (as someone in the photo appears to be doing), or walk on a one-mile loop trail, or go birdwatching. Or you can just pack a couple of turkey sandwiches and a camera and enjoy lunch al fresco, as my grandparents and great-grandma apparently did. July 31, 1975, was a Thursday. I’m guessing that explains why there aren’t that many people on the beach. My grandpa was retired by then; he could go any day he wanted. And since his house didn’t have air conditioning, he wasn’t going to be any cooler staying at home on a humid day than he was venturing out to the shore. It doesn’t really matter where or when the picture was taken, in the end. No matter what its backstory, it’s still an exquisite slice of the stillness of summer, and an image worthy of hanging in a gallery somewhere. Until that happens, this blog will have to do. Ahhh, I would like to go to Cove Island RIGHT NOW! We have been having some bitcherooni hot weather! Even tho we now have air conditioning, that cool scene in the photo looks mighty appealing (especially since we used to go there frequently as kids)!